It took Thomas Edison years to invent an affordable light bulb, but that’s because he was a dummy. If he was really smart, like Alexandria Ocasio-Cortez, he would have done it by merely issuing a press release. After all, if you can hold a news conference discussing your plan for flying locomotives, then surely lift off for the Union Pacific Flyer should only take a few more days. That reminds me, I think tomorrow I’ll announce my plan to build a 49 cent dialysis machine. I should have it done in about a week. Heck, if I’m late I can always blame it on global warming, or climate change or transgender ageism. Seriously, the blatant stupidity and utter ignorance of Alexandria Ocasio Cortez’s “Green New Deal” is astounding. It is as stupid as trying to douse a fire with a mixture of kerosene and diesel fuel. No, it is stupider. But this is what you get when universities teach classes in “economics” that do not teach how food, clothing and shelter are first produced and then distributed. After all, what is an economic “system” if not a method to produce bread, T-shirts and other things we consume — and then get those items to people who want them? And after the corn is delivered a third guy backed by government force is posted at the store. This last government employee makes sure that only other government employees get most of the corn. There isn’t much corn, and most ordinary people who don’t work for the state get very little. That’s how “command economies” work. The state commands people to do something. But, people being people, when you FORCE them to plant corn they do a lousy job. As a result, very little corn gets produced. In a free market economy, on the other hand, farmers plant corn voluntarily. No one forces them to do it. And to boot, the farmers keep any profit they make after the corn is sold. This provides them with an incentive to do a good job and they invariably produce more corn then the guys who were forced to do it. Do you think Ocasio-Cortez learned any of this at Boston University, where she got a degree in economics? I doubt it. Instead, she probably learned about the “economics” of affirmative action programs and gender quotas. Or maybe she learned about the “economic benefits” of paying people not to work. There are plenty of those, because people who don’t work but have money go shopping, and shopping, the Boston University Economics Department has proven, stimulates the economy because it creates jobs for community outreach directors. Or was it jobs for reparations experts, or professional food defrosters? No matter. It was something like that. And these were Green Jobs, because they were performed on top of windmills, or was it underneath solar panels? No difference, as long as the Job Performance Manuals were printed with soy ink, or something like that — you know, something that was Dolphin Friendly, or like, something, you know, um, sustainably equitable. Do you know what Ocasio-Cortez sounds like to me? She sounds like an immature baby who only knows two words of English: “I want.” She repeats these words over and over, but has absolutely no idea how the things she wants can actually be produced, if they can be produced at all. She can become their leader, and that makes her feel important, which is like, um, you know, really cool, and diversified — and it will save the planet and um, end sexism, and you know, fight dis-equalitarian-phobia, or, um, something like that. Like. You know. Um. And did I mention it’s sustainable? Reminds me of my trip to East Berlin when the Berlin Wall was still up. I went by a department store that had a lot of fashionable items in the windows so I decided to go inside. Once inside, I saw the shoe section with a limited number of shoe sizes. Many wanting new shoes had to wait for the next shipment. Went by the coat section, all coats were black and all were the same size. Not a lot of empty racks. Went by the toy section, all the boy’s toys were made of wood with red stars painted on the sides. AOC wants socialism and change and if she were to succeed, her supporters may be in for a big surprise. High speed electric trains have existed for years, are widely used in Europe and Asia, and could safely replace short and mid ranged air travel in the US. It is just a matter of what industry we encourage. At this juncture much more in the way of tax dollars support air travel this could easily be shifted to clean high speed rail. Are you actually foolish enough to believe she claimed to invent a flying train? Anyone dumb enough to believe that would believe Mexico is writing a check to build Trumps wall. "Reminds me of my trip to East Berlin when the Berlin Wall was still up. I went by a department store that had a lot of fashionable items in the windows so I decided to go inside. Once inside, I saw the shoe section with a limited number of shoe sizes. Many wanting new shoes had to wait for the next shipment. Went by the coat section, all coats were black and all were the same size. Not a lot of empty racks. Went by the toy section, all the boy’s toys were made of wood with red stars painted on the sides. 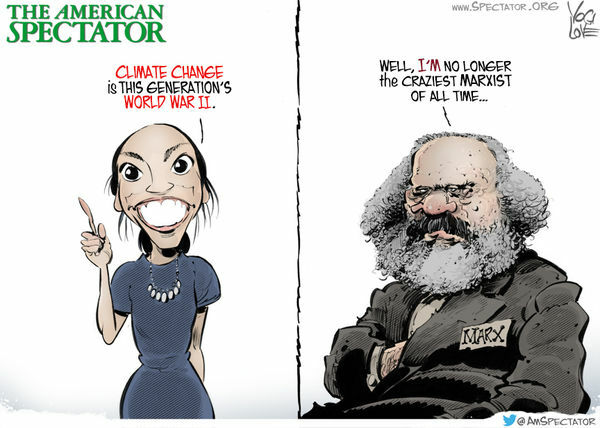 AOC wants socialism and change and if she were to succeed, her supporters may be in for a big surprise." College kids are not briefed on that socialism delivers, and what it leads to. I stopped reading when I learned that she got a degree in economics. You gotta be kidding me! This woman is a dolt with nothing but mush between her ears. what she's saying, she will fade off into the sunset. Maxine and Pocohontas and take their show on the road. Hell, I would even pay to see it. A great show to laugh at, but no pennies from me. Kevy, I never thought much of your post,s but this one really caught my eye as you hit the nail on the head, and just in one swing. Let us hope that we can agree on more issues. Not likely to happen, but like religion there is always hope. I think that we should give Alexandria Ocasio-Cortez a vacation on the Island of Hawaii and for that trip she will also be awarded the opportunity to become the first passenger on the Airborne Locomotive to Hawaii. If she makes the flight she will indeed be awarded the most brilliant of her time and may even become president of these United States. "I think that we should give Alexandria Ocasio-Cortez a vacation on the Island of Hawaii and for that trip she will also be awarded the opportunity to become the first passenger on the Airborne Locomotive to Hawaii.."
I think she may be more realistic, and wait for the tunnel route. Yep, AOC makes nitwit's look like Rhodes Scholars! Then she can drive herself after they put in all of those recharging stations on the ocean floor. Imbecile is a perfect definition for AOC! "Alexandria O’casio Cortez (AOC) gives a new meaning to the word “Imbecile!" Alexandria O’casio Cortez (AOC) voters gives a new meaning to the word “Imbeciles"
The voters are getting what they deserve. They “lowered the expectation bar” and another snake crawled in!